Tweets from Motorola India that were disseminated starting last weekend, indicate that the Motorola Moto G Turbo Edition will be launched in the country this Wednesday. 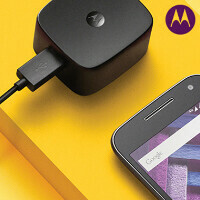 The device supports the Motorola Turbo Power quick charging feature, which requires the use of a special adapter that comes with the phone out of the box. In Turbo mode, the Moto G Turbo Edition will charge the 2470mAh battery at speeds up to 75% faster. The Motorola Moto G Turbo Edition is equipped with a Gorilla Glass 3 protected 5-inch screen, carrying a 720 x 1280 HD resolution. The Snapdragon 615 chipset is under the hood, containing an octa-core CPU and the Adreno 405 GPU. 2GB of RAM is inside, along with 16GB of expandable storage. The 13MP rear-facing camera has an aperture of f/2.0, allowing you to take pictures even under low-light conditions. The 5MP front-facing camera snaps selfies, and handles video chats. Android 5.1.1 is pre-installed. With a IP67 certification, the Moto G Turbo Edition can be submerged in over 3 feet of water for as long as 30 minutes, and emerge unscathed. That is a major improvement over the typical protection to light rain and spills that Motorola provides some of its other handsets, through the use of nanocoating technology. The Motorola Moto G Turbo Edition will sell in India for the equivalent of $283 USD. The device has already been released in Mexico. I dunno about that. It may have decent multicore capability, the GPU is rather weak (Adreno 405) and it can get quite hot/throttle under pretty normal usage. Just wait for a month and get 620 processor phones I dont know its qualcomm issue or oem for not using the latest processor By now phone should come with at least 620 If its a old announced phone than nothing can be said..
620-based devices will cost much more. Sd 620 is in different league altogether. It's one notch below 820. 615 is small potatoes. Sooooo...all they added is the turbo charger from the moto x style, no?